The Actions menu enables you to customize your visualization and have more control over the data displayed in your Klips. With the Filter action, you can quickly set conditions, pick data to include and exclude from your Klip, and choose whether to Filter on raw data or displayed data. After Filter has been applied to a sub-component, a Filter icon displays next to it in the Component Tree. Actions applied to one sub-component are also applied to the other sub-components. If Filter is applied to a column in a Table component, it is applied to all columns in that Table component. Learn how to access the Actions menu. The options available when including or excluding data vary depending on the data type. If you are filtering on numeric data that is formatted as a number, currency, percentage, or duration, you can use the slider or enter a number to set the range of data you want to display in your Klip. By default, the Include Blank check box is selected but you can choose to exclude all blank values by deselecting this option. Top/Bottom filtering is available for numeric data. Use this option to display a set of values with the top or bottom values from the data. Maximum value: Equal to the amount of values in your data. For example, you can filter to display only the top 10 values from your data by selecting Top from the menu and entering 10 in the field. If the data is formatted as text, hyperlink, or date/time you can use the pick list under the Member tab of the Filter dialog to choose values to include or exclude in the display of your Klip. To only include specific values of data, you can select them from the pick list and click Filter. Only selected values will be displayed in your Klip and any new values will not be displayed. To exclude specific values, you can select the values you want to remove from the display of your Klip and select the Exclude check box at the bottom-right corner of the Filter dialog and then click Filter. All values except for the excluded values will be displayed in your Klip. The Exclude option is typically used to remove column headers from the visualization display. Note: You can use the search bar to find specific values in your data. 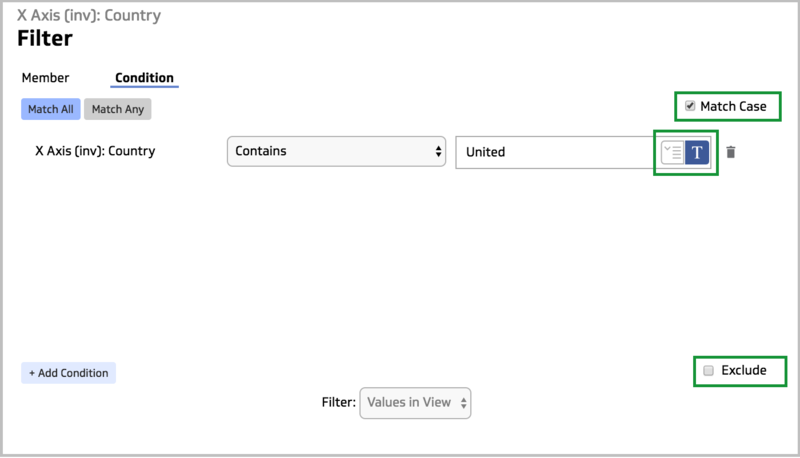 You can use the Conditions tab to define conditional filters to apply to your data. The drop-down menu lists operators for your conditions based on the data type you want to filter on. For example, numeric data includes operators like greater than and less than. Textual data includes operators like matches, contains, and does not match. Date/time data includes today, yesterday, unit to date, in the last, on or before, on and after, and last full operators. To complete the condition, you can type in a single value or choose a variable from the drop-down menu. If your data is formatted as date/time, you can select a date from the calendar picker. If you are filtering with a date variable, the date must be in Unix time format. The data that matches the conditions will display in your Klip. To exclude data based on the conditional filters, use the Exclude check box at the bottom right corner of the Filter dialog. The Match Case check box enables you to match your value according to its letter case. Add multiple conditions to further customize the display of your data. Choose Match All to filter the selected data according to all the conditions set. This is similar to the functionality of the AND function. Choose Match Any to filter the selected data according to any one of the conditions set. This is similar to the functionality of the OR function. This option enables you to choose the order in which the Filter and Group actions are applied. Rows in Source (default): Filters the formula results based on the raw data (before the Group action is applied). The order of applied actions is Filter then Group. Example: If you want to filter out all sales under $5,000 and group the remaining values to display in your Klip, you would use Rows in Source. Values in View: Filters the formula results after the Group action is applied. The order of applied actions is Group then Filter. Example: If you want to filter on total sales for each sales representative, you would group the sales by sales representatives first and then filter on the displayed values by using Values in View. Note: If Group is not applied to a sub-component, Filter will be applied to Rows in Source. Create a User Input Control component and a Table component. The User Input Control will control the results of the data returned in the Table. In this example, when a country is selected, the Table will return cities and scores for that specific country. Use the Group action to group repeating values of the column of data you want to display as options in your User Input Control component. 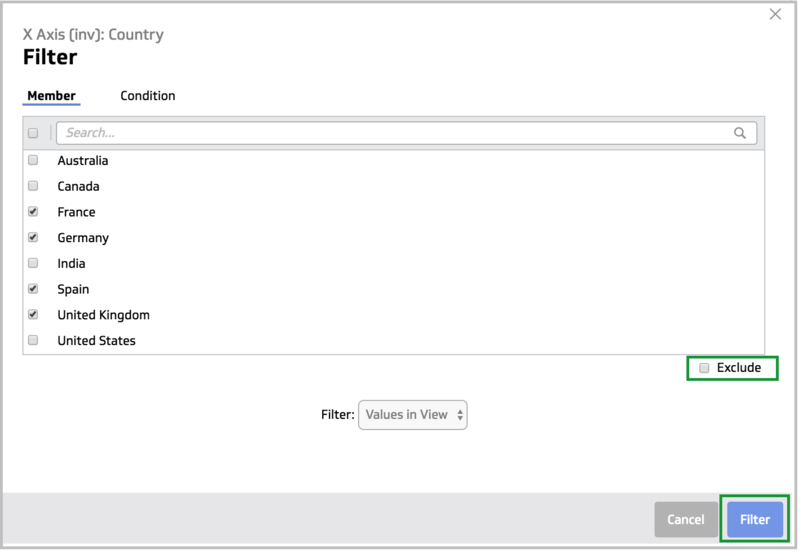 In this example, the country names are grouped so the User Input Control displays each country name once. Use the Filter action to Exclude the column header from both the Values sub-component of the User Input Control component and the column of data you want to display in your Table component. Note: An alternative to using the Exclude option to remove your column header is setting a condition. Using this example, the condition would be: Does not match the column header, Country. Select the User Input Control component, and in the Properties panel, select a variable from the list or create a new variable. This variable will be used to change the data displayed on the Table component according to what is selected in the User Input Control. In this example, the variable name is countries. Select the Table component. Use the Filter action to set a condition that Matches the variable you selected in your User Input Control component. The country selected in the User Input Control will display the corresponding data in the Table.